Trying something new this weekend. 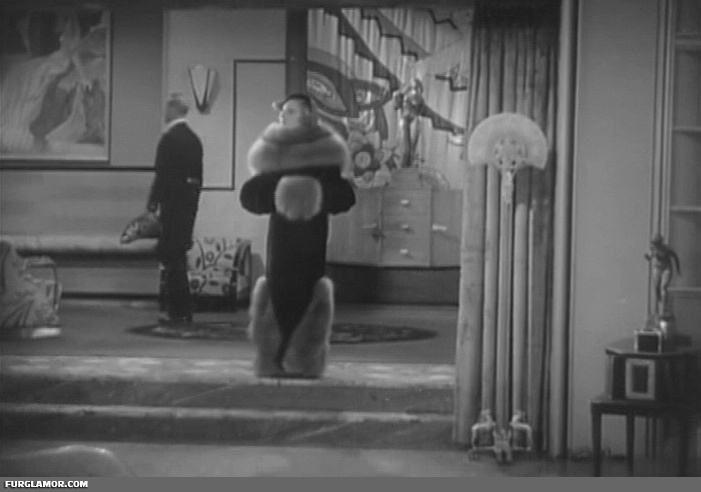 There’s some amazing furs in a lot films, particularly from the 1930’s, but squeezing an entire update out of just one really nice fur in a single film can be tricky… unless you’re The Awful Truth. Since many films don’t quite warrant the full treatment yet shouldn’t be overlooked entirely, I’m going to combine a group of of them into a single update. So I present the first: “Thirties 3 Pack.” Which is a dumb name, so if anyone has a better suggestion, feel free to drop them into the comments. The story of Mary Wentworth, who goes from waitress to lawyer and gets mixed up with the mob. How do you celebrate your new mob lawyer salary? Big white fox fur wrap, that’s how. Someone more skilled in the technicality of fashion may be better qualified to say where the sheer size of this wrap translated into full “cape” status. 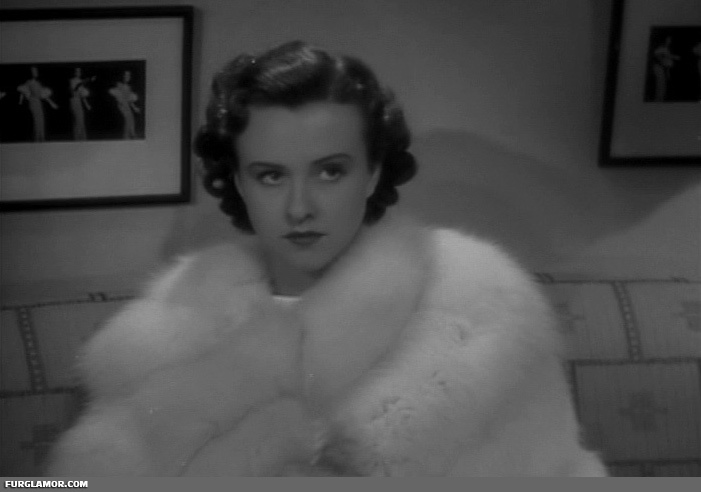 The fur is well filmed, providing both wide and a couple closer shots that show Miss Lindsay surrounded by white fox. 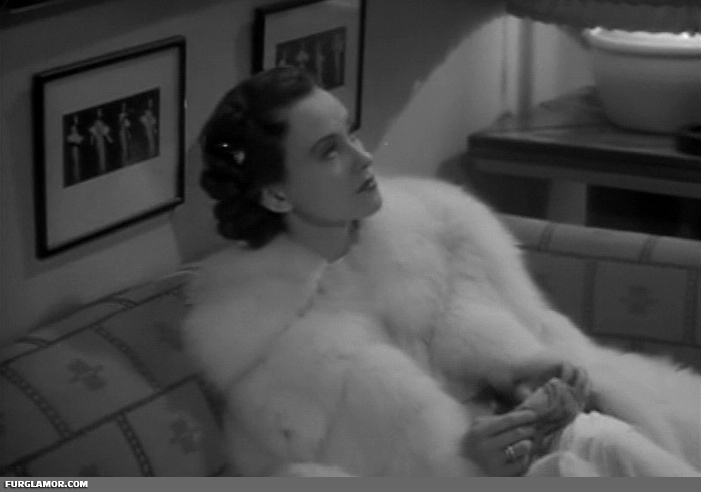 I made my feelings on Joan Crawford clear with the They All Kissed the Bride update, but allow me to reiterate: 30’s Joan Crawford is an amazingly beautiful woman, and this sequence from The Bride Wore Red is one of my all time favorites thanks to the perfectly framed close ups. 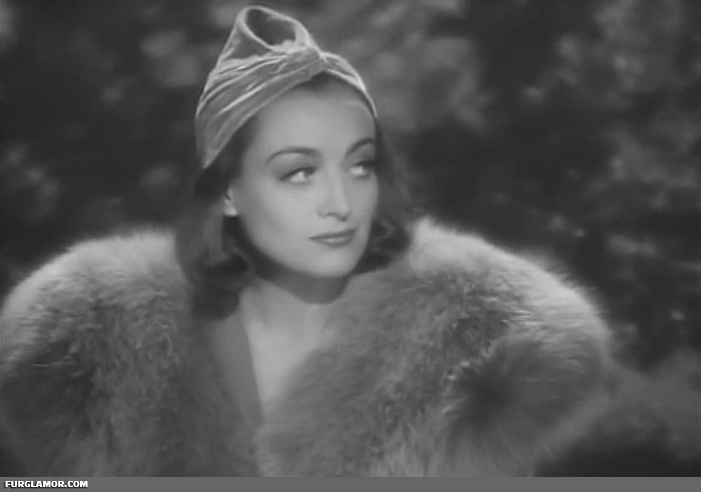 Miss Crawford plays Anni, a chorus girl who ends up warmly dressed on her way to an upscale resort in the Alps as the result of a lark by her boss. She meets the humble postal clerk that services the resort and totally doesn’t end up falling in love with him. Oh, wait, yes, yes, she does. 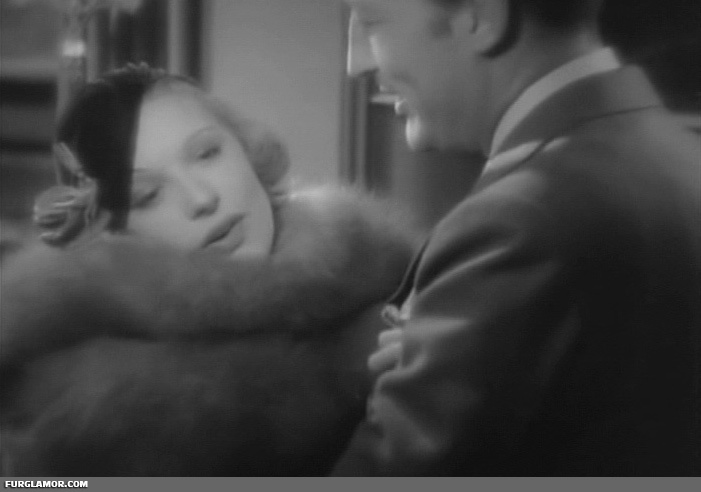 I really don’t care about the plot of this film, just looking at Joan in this enormous fox fur collar. Honestly, one might guess it’s “red” fox, but I doubt that… color pattern is wrong. This shot alone is worth everything. 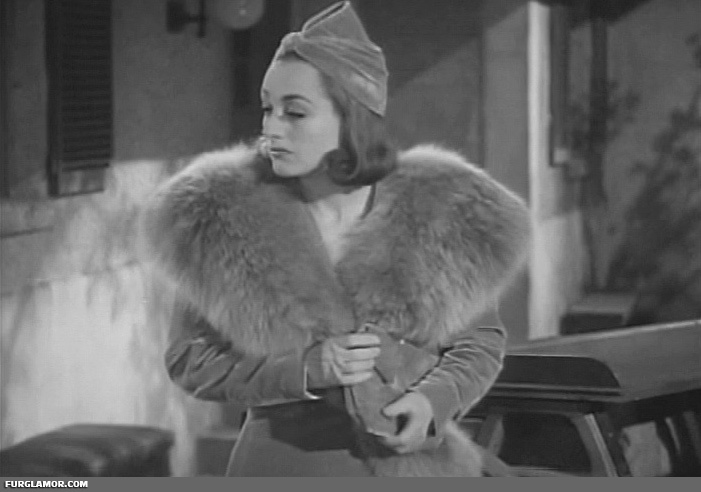 It perfectly frames Joan Crawford’s face and the collar, just low enough to catch all the fur but not so far as to reveal the remainder of the coat isn’t fur. 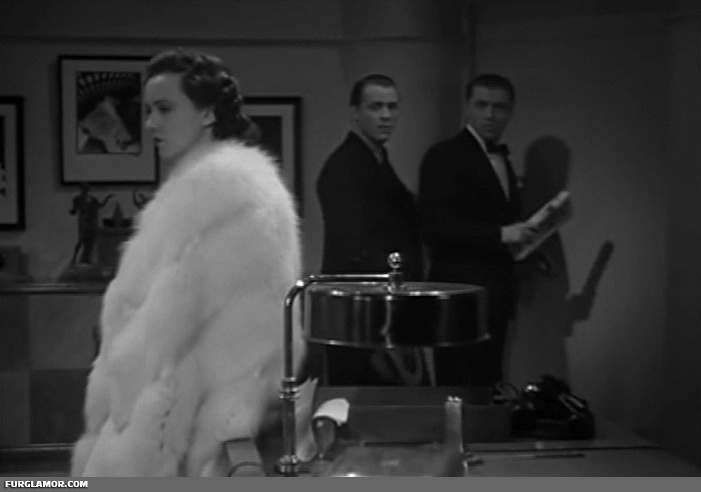 Those unable to concentrate quite so exclusively on collars can check out the They All Kissed the Bride update for Miss Crawford in a very large full length fox coat. Sometimes the best are the hardest to categorize. This outfit from the last reel of The Match King is shown head-to-toe just as it enters, allowing us to fully appreciate the work of the costume designer. Lily Damita plays Marta Molnar, an infatuation of the titular Match King, who is dropping by to tell him that whole “liking her” thing isn’t going to work out. She can dump me any time wearing this outfit. Like all the furs covered in this update, this sequence is marvelously well filmed, providing a variety of close shots. The size of the collar is clearly on display here as we’re treated to a shot of this massive fur collar that drapes her shoulders. A last closeup of Miss Damita and this fox fur collar. The Match King takes the break up pretty hard, and I can’t blame him. No “Fur Runtime” stats for these, as they would be rather unimpressive. Each is pretty much the only fur of any note (or at all) in their respective films. That’s the point of this update, and perhaps future updates of the same sort, to give these “One Fur Wonders” a chance to shine. Next time maybe I’ll find a group of films that don’t start with “The” either. Does this update agree with you, dear readers, or would you prefer to see single film updates? Comments on this topic are welcome. 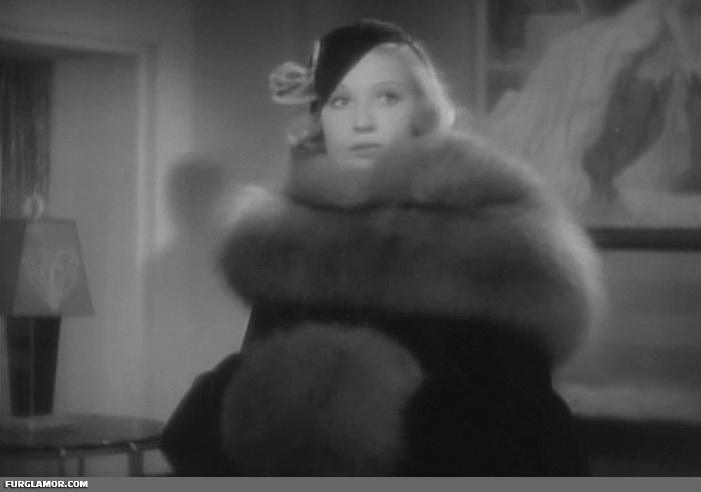 Fur Fashions of the 1932 film The Match King. 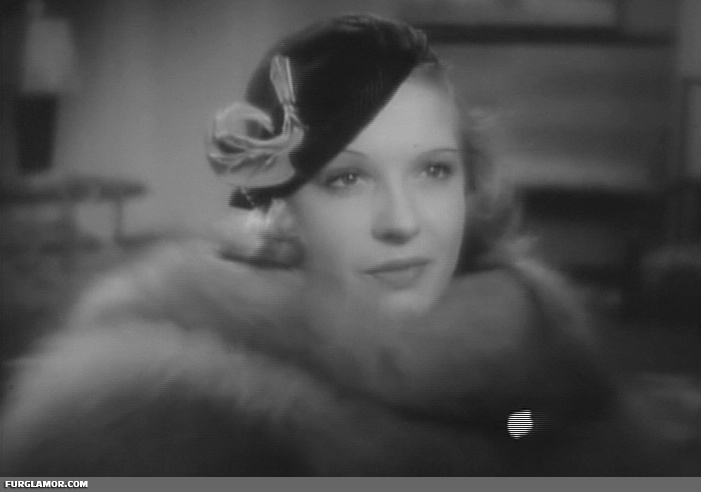 Fur Fashions of the 1936 film The Law in Her Hands. 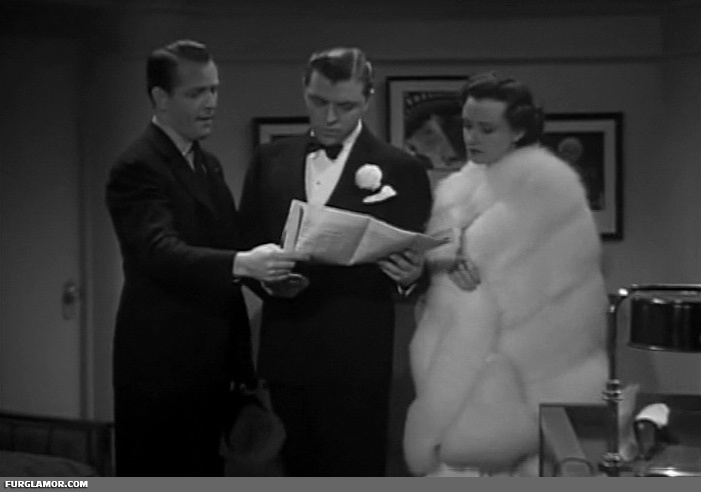 Fur Fashions of the 1937 film The Bride Wore Red. Regarding the name; I do not think you need to give them any special title, to me they are as an important part of fur fashion as a film with lots of clips. You post whatever you wish (preferably from the thirties) as I find your site to be really good and i must commend you for your hard work; if it had not been for you i would have missed out on several good fur films. I have never seen the first film. Personally I thought The Bride Wore Red clip to be to short for my taste, the collar was nice but not outstanding. I have mentioned The Match King before, to my mind the clip is wonderful; that outfit is amazing and worth looking at over and over again. The clip is actually 3.00 minutes long; not bad! The only real thing that bothers me is the possibility of having to shell out the cost of a DVD for two minutes of fur. Boo-Hoo tube had lots of films containing short sequences of fur but they have all been removed. There must be thousands of films still available with fur in them; I have 400+ clips. Pursuant to the possible loss of films posted to YouTube, I may suggest there is a way for individuals to preserve locally the videos they find on YouTube, a “backup” if you will. It merely requires the use of FireFox and a plug-in called “Video DownloadHelper“. With that combo you’ll be able to save your favorites locally and no longer have to concern yourself about their longevity. To view the .flv clips, just grab VLC Media Player. VLC is a very handy tool for any web video enthusiast. 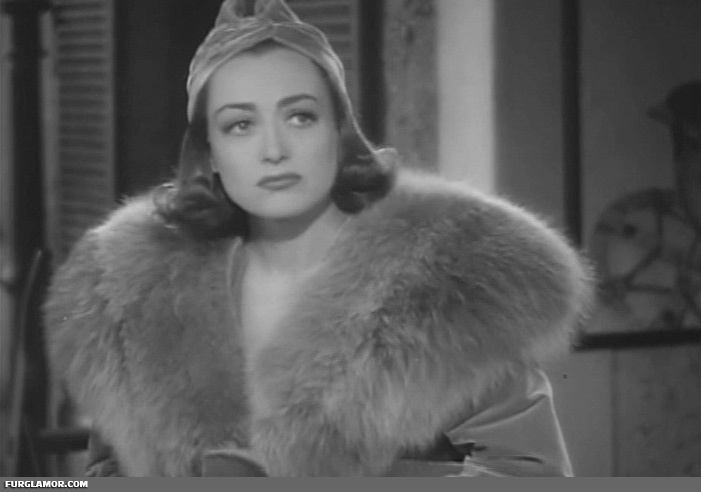 Additional notes: The Bride wore that “Red” for a good 5 minutes, and that’s not even counting the bits I trimmed out due to lack of Joan Crawford in giant fox collar. Sadly, can’t be of any help with suppliers, I don’t have any special source, just what I grab on the DVR from TCM and the like. I’m thinking about buying some DVDs of only the absolute best stuff, but only if I can make sure they’re 480p picture quality and in the original aspect ratio. I’ve found DVDs that are neither and that’s a slap in the face. Sorry, A/V geek rant. Thank you for the info but i have already done that; I referring to people who had not watched the films and have consequently missed out. I must admit in retrospect that I believe thay the copy of The Bride Wore Red that i watched was not of a very good quality so the fur did not justify me keeping the clip but I would imagine that the DVD is readily available.